Yes Anthony said he missed the storm and I know the road network when we chased last year - it is a bummer. The storm weakened and then intensified. The weakening phase once again allowed it to venture northeast until it hit the coastal strip. Jeff you say flying eagle - in what stage and which radar image are you referring? Michael and Rodney were unable to venture anywhere near the eastern side of the ranges which is where the main radar images were taken. Any chance of getting hold of doppler radar images Michael particularly when there was a hook? This is indeed another example of a mini supercell outbreak and yet again no tornadoes intercepted amongst all the chasers chasing around. This yet again emphasises the importance of specific dynamics to be in place for tornadogenesis and adds fuel to the debate against the argument supporting numbers of tornadoes in Australia. 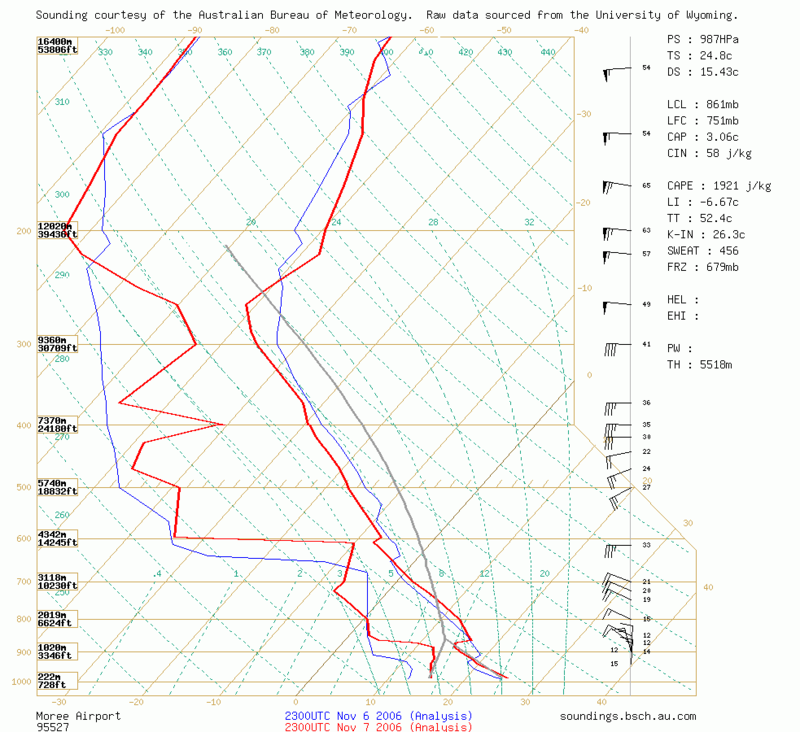 Nevertheless it goes to show you that 30 knots at 500hPa can still spawn structured supercells. I thought Jeff was referring to visuallly a flying eagle - not radar ? It had a weakening just after this 0320z image (0330 missing - typical), before reintensifying. The supercell overshoot creates a shadow in the windstream like a rock in a stream (although we have to be careful using this analogy given we are talking about fluid dynamics). Some sembelance, not exact, maybe more a visual. When i heard the rock in stream analogy i thought jimmy have you lost your marbles? 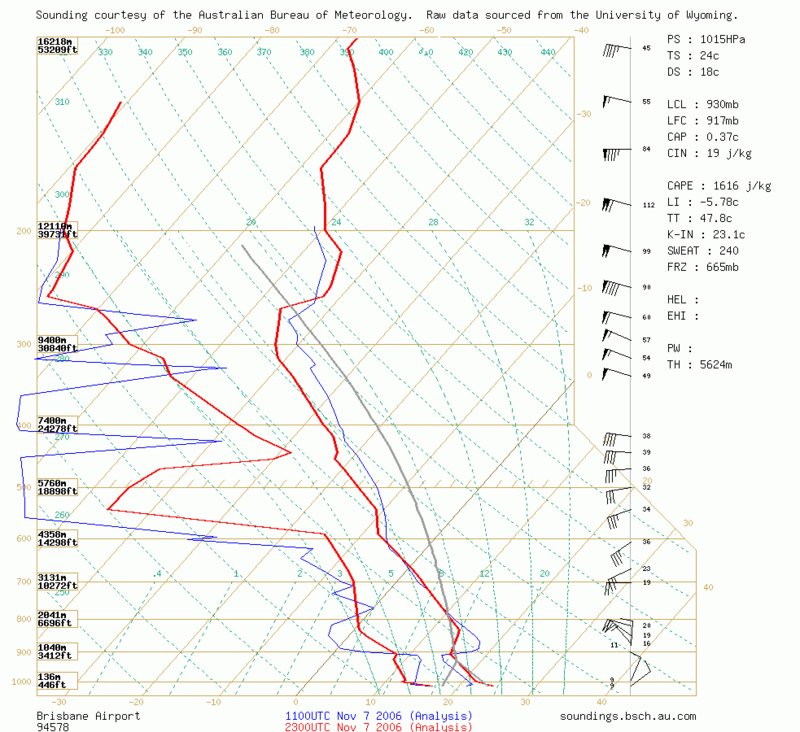 Looking at the sounding profile I just dont think there was enough direction change within the shear structure to fully organise the updraft(Contentious i know), Also given the not exceedingly high CAPE values and evident non intense updraft maybe the lower level wind pattern was enough to disturb any weak vortice that was going to spawn? Im not entirely sure about these, but i thought id put my ideas out in the open to your critiques. John, IMO this was definitely not what I would call a 'potent' situation from charts / models (Feb 2nd, since it has been compared to this event, was). That said these two storms did organise beautifully and no doubt had very, very decent mesocyclones - both were long-lived and intense (the northern storm looked did look like an ugly big HP blob compared to the southern storm). Anyways, there was no problem at all with updrafts fully organising (in fact, it doesn't get all that much better). The problem (for tornadoes), as evident if you look at Michael's pictures, is that the storms are extremely wet - largely since the mid-level flow was weak (for a tornadic supercell event). RFD buoyancy is thought to be important to tornadogensis and you can bet these storms had cold RFDs from all that rain and hail - care to comment Michael?. Also, storms did move sharply left such that SRH would be enhanced, but overall environmental shear through 0-1km or 0-3 km, take your pick, were fairly weak. BUT -- it is worth noting that there may have been a tornado with the northern storm!!!! Tornado with the northern storm - has that been verified? The shear was better in that region. John I am not sure what you were trying to imply in your statement in regards to the analogy? I guess I forgot to mention the hook signifying the head of the eagle. What sounding were you refering to John? My appologies, MB I thought you on the northern side of the cell in Qld. I didn't realise at first that you were in fact on it in it's earlier life ( i should look closer at the radar timestamp!). Well that just increases my opinion of this supercell! Fair dinkum if it looked that good at Kyogle how good would it have look west of the Gold Coast with it's strongest radar echo? Don't get me wrong about my comparison to feb 2nd 2005. it was merely a comparison of storm scale dynamics or the way the storm looked compared to the supercell in Sydney on Feb 2nd. I wasn't comparing the systems as a whole though the Feb 2nd 2005 system was far more potent as proved by the viloence of the winds on that day, both mesocyclonic as well as rfd. As for the flying eagle signature - the radar scan at 0500utc shows as good as almost any scan can get a calssic HP supercell signature with curved outflow, inflow notch, hook, curving rfd outflow front and a split in the downstream outflow caused by the updraft. Taken as a whole you can call this a "flying eagle" signature. The radar signature when you were on the supercell MB displays a weaker "flying eagle" signature but it's still there imo. Man there is nothing I love seeing more than that signature on a radar! Awesome!!! 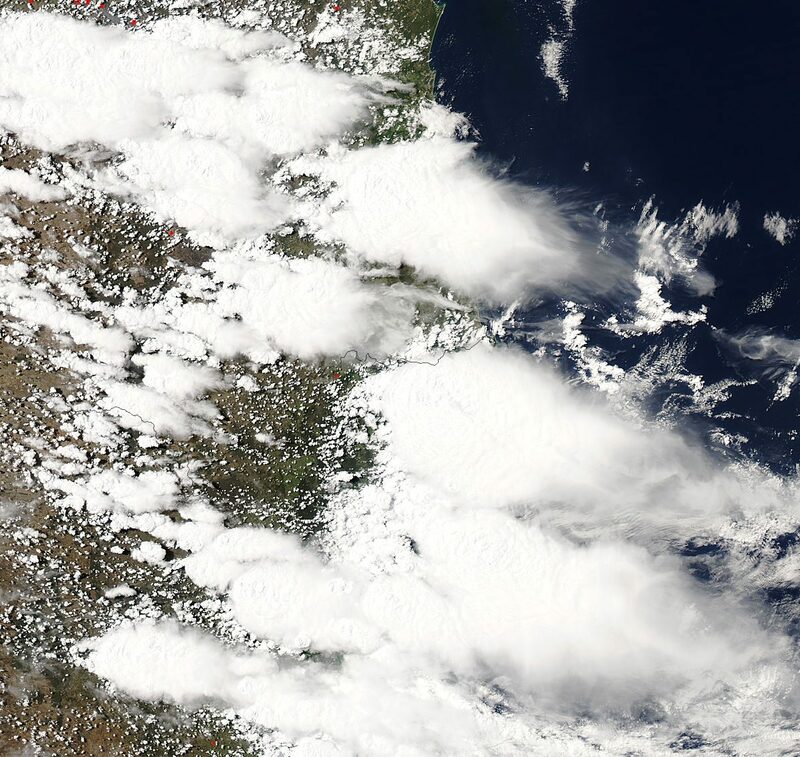 Hi Jeff, after seeing the photos, Jimmy and I has discussed the similarity in appearance of the Kyogle storm to the Feb 2nd -- hence the comment I made. Then again, since they are all similar phenomena I guess it makes sense that they look similar!!! Thanks for your observations Michael! No worries - I save all loops for all days where storms occur between Canberra and north of Bris - ie - to cover everywhere both Jimmy and I chase - for the purpose of adding to reports when appropriate. Got archives going back to when radar first became available in 1998. I didn't have the internet back then, however I heard the Bureau gave access the radar images to the general public in 2001. For me, the next time a storm comes around I'll save the images, and put them in a loop. Anyway, keep those loops on coming.